The exterior shows off particularly well the artistry of the unknown architect in playing with volumes and spaces. You enter by the Pardoner's door, formerly the majestic entrance of the old mosque and you will see another vestige: the peaceful Orange tree courtyard. The adjacent Giralda tower was the original Minaret of the Mosque. 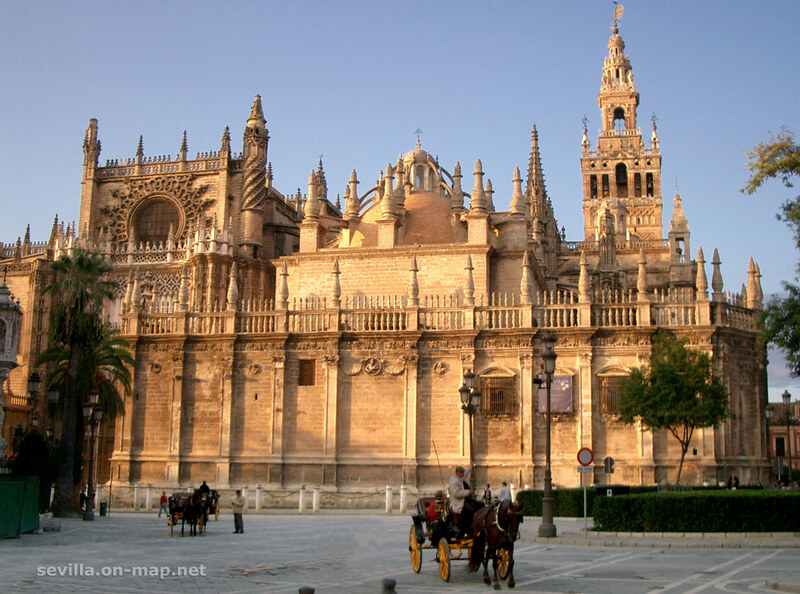 Inside the cathedral of Seville you will be struck by the size and richness of this universe of stone, stained glass windows and wrought iron work. The lightness of the columns accentuates the height of this hall-church with five spaces and lateral chapels. The simple crossing ogive vaults cover the nave except for the transept crossing where the flamboyant vaults stand 56 m tall. A mirror in the floor lets you appreciate the superb carving. You can also find what is supposed to be the tomb of Cristopher Columbus.